I’m sure you all know Brandy of Nutmeg Nanny. She has guest posted here twice (three times now!) and she has also been featured in my “a day in the life” series. Her blog recently got a makeover and I just love it! It is so beautiful! Brandy is a great friend, has unbelievable skills in the kitchen and she is so much fun to chat with. 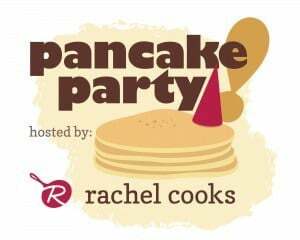 I’m so happy to be back on Rachel Cooks! This pancake party is a blast and I’m so happy to be included! Now, onto the deliciousness! When I grew up we had a massive garden in our backyard. We generally grew the same things each year – tomatoes, snow peas, beans, cabbage, lettuce, onions, carrots, popcorn, sweet and spicy peppers, watermelon, musk melon and of course yellow and green summer squash. The thing about growing your own garden is there is a point during the summer where you have so much produce it starts overtaking your life. There is only so many squash your neighbors will take before they start running back inside their house when they see you. Plus, there is only so much chocolate zucchini cake one family can eat. That is where these pancakes come into handy. They really switch things up. They give a new twist to the squash overload baking extravaganza. Especially when they are drizzled with a little creamy goat cheese dressing. Oh yes. I just said that – creamy goat cheese dressing. It was amazing. I may or may not have licked the plate clean. 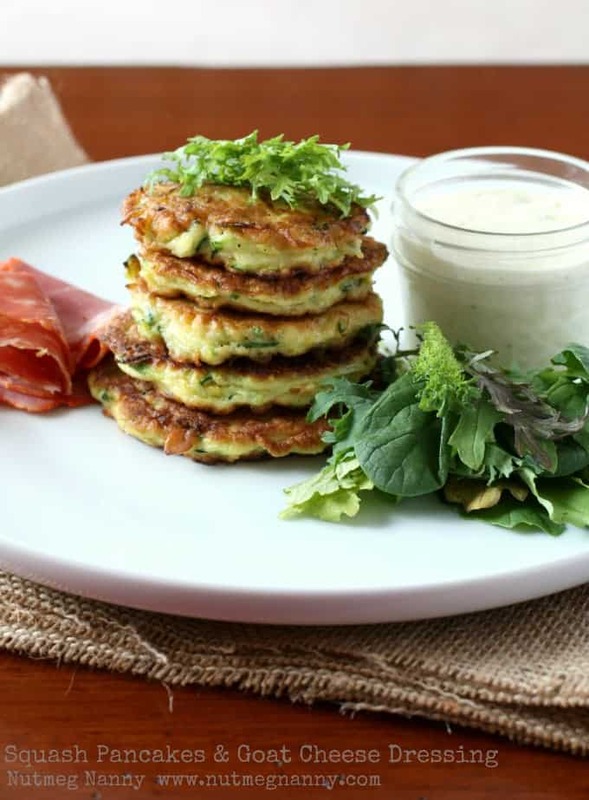 I also paired the pancakes with a small fresh greens salad and some hot capicola. I figured I should make this delicious dish into a full meal. It would make a great brunch meal or even a delicious light summer dinner. Using a food processor shred your squash. Add squash to a large bowl and add shallots, egg, flour baking powder and spices. 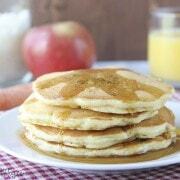 Heat vegetable oil over medium heat and drop batter into oil (about tablespoons) and fry until crispy on both sides. 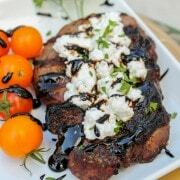 Top with goat cheese dressing and serve with salad and hot capicola. Makes about 10 small pancakes. *Note: If you notice the batter start to get runny just add a little more flour. The longer the batter sits the more water the squash will give off. In a blender combine all ingredients and blend until creamy. Brandy knows I don’t like goat cheese–I think she made that sauce just for that reason. But I have to say, I am tempted! It does look amazing! Find Brandy on Facebook, Twitter and Pinterest. this was pretty good. we think the honey ratio is high tho- expected to taste the goat cheese over the honey but it was sweeter than expected. next time i will cut the honey to 1 teaspoon i think. served it with a 2003 Bogle Phantom which serves well to goat cheese but the taste of goat cheese was not so present as the honey was. but the pancakes them selves were the bomb. Well these were just delicious and so so easy to make! Baking them was the easiest thing ever and there was no crumbling at all! Did not have goat cheese on hand so used coconut milk instead so the sauce was a bit too much on the runny side but delicious anyway. Ooooh I love this idea, that goat’s cheese dressing sounds amazing! 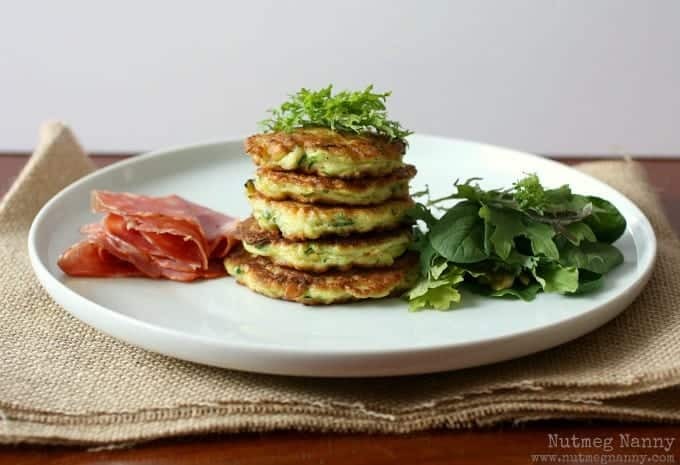 Love this savory take on pancakes… And, a great way to use up some extra squash I have hanging around. Looking forward to giving this recipe a try! I love these. Grown up pancakes. I’ll take a stack. Is it weird that I really want these for breakfast? They are gorgeous and sound so delicious! How did Brandy know I’ve been looking for a squash pancake recipe?! This is so timely. Seriously cannot wait to try these – they’d be the best summer lunch! Im with Amanda, love a savory pancake!! And the goat cheese sauce, oh man. I’m seriously craving these right now. Awesome post! Mmm, I love a savory pancake! Especially if it’s topped with cheese! Just made these! They were SO much easier than I thought they would be! Instead of getting out the food processor, I just used a grater to shred the squash, and a small whisk to make the dressing, although I’m sure it would have combined more thoroughly if I had used a blender. Also, the serving size feeds about two people if you’re serving it as a dinner – i had to double it to feed the four of us. I served with a small side of spinach, tossed with a small amount of the goat cheese dressing. Delicious! Thank you for the recipe! I’ll definitely be making these again. I love how you incorporated zucchini and yellow squash. Nice touch. Yummy! 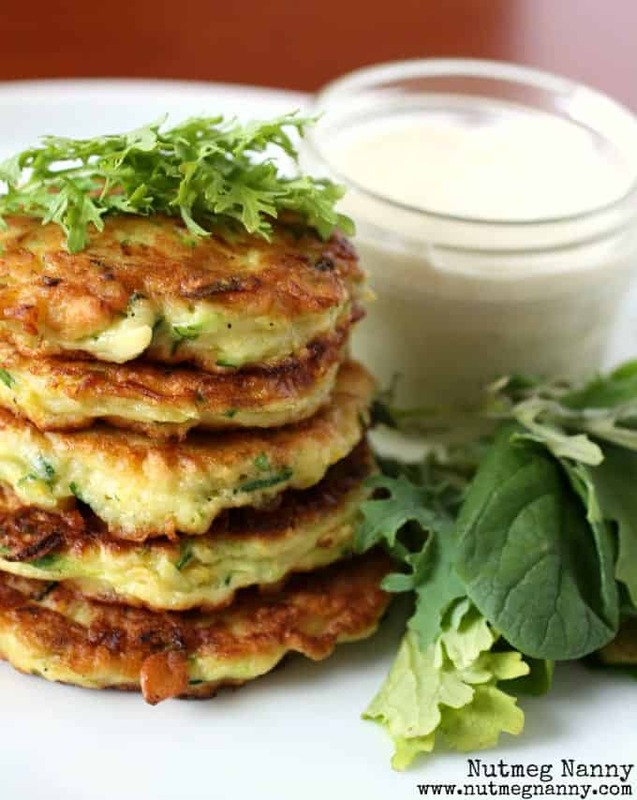 I adore zucchini pancakes and that goat cheese dressing sounds like it would make them even better. Great recipe, Brandy! Thank you so much for inviting me to join this party! I had such a great time coming up with this delicious recipe…yum! Creamy goat cheese dressing has me drooling. I adore this Brandy!! 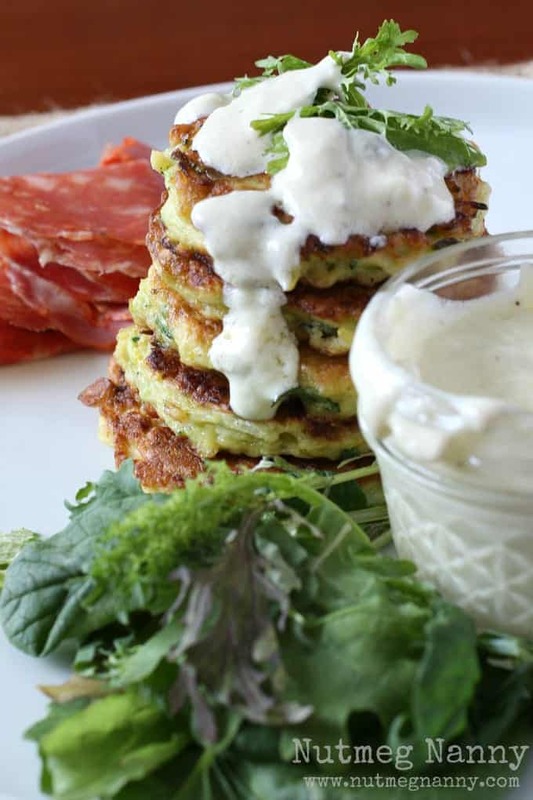 This is such a perfect way to use zucchini especially with that creamy dressing! Sounds like a wonderful combo. I love this idea!!! Always love going “savory” for breakfast…and that goat cheese dressing looks way too good! YUM, I posted a similar recipe yesterday… I’m really wishing I had thought of this goat cheese dressing for my cakes!